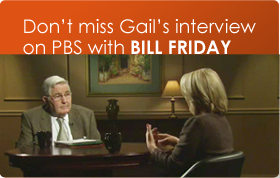 Times are changing, and fundraising is evolving too. If you want to be successful, then your nonprofit’s fundraising approach needs to adapt and innovate. If you stick to the same old same old strategies, you will probably see declining revenue and shrinking numbers of donors. Note: I am not touting shiny new ideas or be-all solutions. Every nonprofit needs a well-rounded fundraising program with diversified sources of revenue. These are the strategies that are coming into their own as important. Adopt the ones that will enhance your work. Discard the rest. And don’t forget! The new U.S. Tax Bill is dramatically changing the tax incentives to give. There’s new potential for major gifts, but we are predicting that smaller and mid-sized donors will probably cut back their gifts. See my full discussion of the tax bill here. Fundraising Trend #1: Donors Are Not Sure They Trust You. Across the board, there is a steady decline in trust of society’s institutions, including nonprofit organizations. This emerging distrust carries over to your donors, who are generally wary about how NGOs are using their money. According to a recent Fidelity study, more than 8 in 10 donors say they have concerns about how their donations will be used and if their gifts will really make a difference. 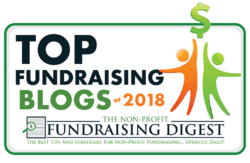 Takeaway: Build donors’ confidence by being “transparent” about your fundraising: explicitly share how much you need to raise, why, and how the funds raised will be spent. Fundraising Trend #2: The “Donor Experience” Reigns. Much of our work on donor retention is morphing into a new focus on the broader overall Donor Experience. Smart organizations are mapping out a true donor-centric “Donor Journey” – outlining what each donor experiences when they give to you over time. Takeaway: The new CRMs and analysis platforms start by eliciting feedback from donors. Then they add data on the donor’s transactional and behavioral history. And presto, you can create truly customized donor experiences. That’s the future! Fundraising Trend #3: Advocacy is the new Fundraising Skill. As government funding for our sector comes under fire, especially in the U.S., smart nonprofits will sharpen their advocacy skills. Learning how to appropriately engage and communicate with local, state and federal government officials will be a necessity for 2018. Takeaway: Learn to treat officials who influence funding decisions just as carefully as if they were major donor prospects. 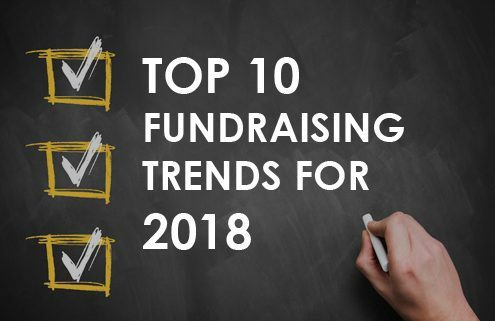 Fundraising Trend #4: Sophistication is Increasing at All Levels. Fundraising is getting more complex, multifaceted, and data-driven. Smart nonprofits of all sizes are building their expertise, and making use of the new digital and social tools to build causes and support. Takeaway: Don’t let your nonprofit’s messages and appeals begin to look old and stale. It’s worth the investment to give your staff professional training and education – you’ll bring in far greater revenues. Fundraising Trend #5: Crowdfunding and Giving Days Have a Great Future. Giving Days will only get stronger as smaller and mid-side organizations truly master digital and social media. Crowdfunding projects are successful because they combine a specific fundraising goal with an urgent deadline. Then they add elements of gamification, fun, and social sharing to create a potent mix that can raise serious money. Takeaway: Invest in digital and social media training. Test your messaging and shares, and recruit “digital ambassadors” who will promote your cause on the next #GivingDay. Fundraising Trend #6: Watch out for the New Philanthropists and Social Entrepreneurs. These nontraditional donors are often wildly wealthy and much younger. And, they’re developing their own disruptive solutions to deal with society’s ills, ignoring traditional nonprofit approaches. Guru Kay Sprinkel Grace says that our whole sector is at risk because of all the new alternative forms to solve social problems. Takeaway: There’s room in our sector for multiple approaches. Disruption and experimentation can be good. But look over your shoulder and be prepared to be impacted. Trend #7: More Major Gifts Will be Available to All NGOs. With the growing wealth in the U.S., huge gifts are possible to more and more nonprofits. Larger donors (gotta love them) will have more power than ever. 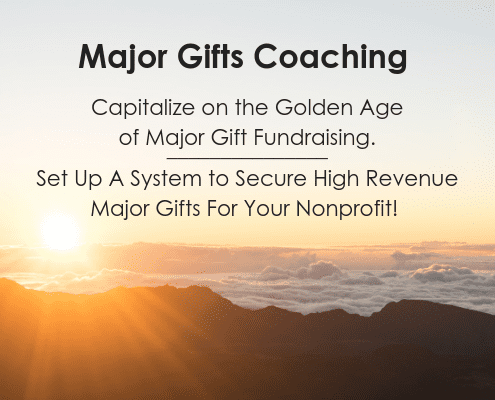 Major gift fundraising skills will be needed more than ever. Takeaway: Committing to a systematic major gifts program over time and investing in training will pay off handsomely for your nonprofit. 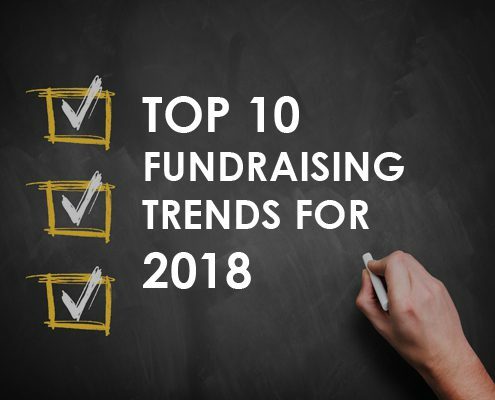 Trend #8: Internal Support for Fundraising is a Make or Break Issue. Do you truly have an internal culture that supports fundraising? Does the entire organization support the fundraising staffers? How much are donors valued? Does management push fundraisers to be out there asking all the time, rather than nurturing donor relationships? Takeaway: Organizations that offer wholehearted support to fundraising – and to donor relationships – will always raise far more money. Trend #9. Sustainer Fundraising Programs Will be King. Monthly giving offers enormous potential for every single nonprofit. It’s past time for your nonprofit to seriously commit to this fundraising strategy. 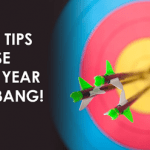 You’ll be enjoying repeated, ample revenue from a loyal group of donors who love you. Takeaway: Sticking with your sustainer program over time, because it can years to gain traction. Trend #10: The ROI on Fundraising Investments is Real. Large organizations like universities have always understood that spending more on fundraising will result in extraordinary increases in revenues. But the concept of ROI is finally taking hold in small and medium sized organizations. Boards and CEOs are gradually understanding that if they need more funding for programs, the best way to get it is to spend more on fundraising. 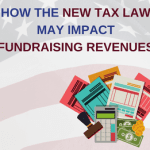 Takeaway: Want a larger fundraising budget? Then run the numbers and demonstrate how you can raise more with a larger budget. What about you? What are you focusing on for 2018? Leave a comment and let us know!